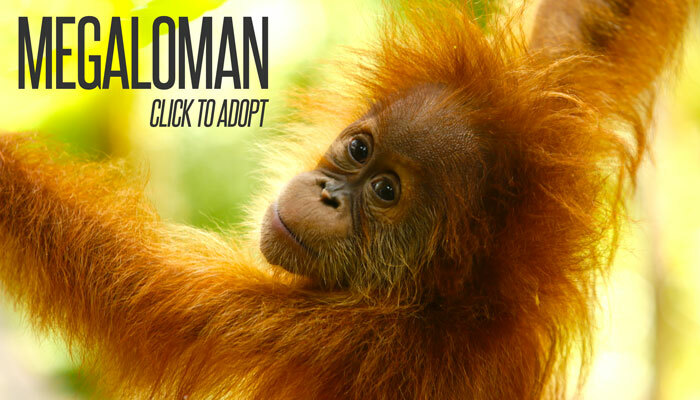 Orangutan Outreach is enormously proud to be collaborating with the Sumatran Orangutan Conservation Programme (SOCP), an organization that has been working to protect the critically endangered Sumatran Orangutan since 2002. Visit the SOCP website to learn more about their phenomenal work. 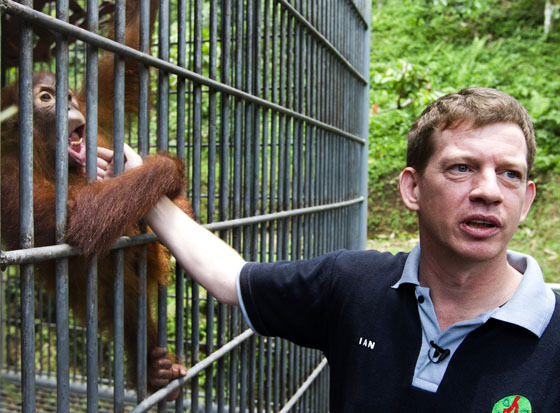 Led by Dr Ian Singleton, SOCP has a proven record for delivering measurable results in the field of confiscations and reintroduction of orangutans, long-term research and monitoring, as well as a strong dedication to the conservation of critical orangutan habitat in a country where there continues to be enormous pressure for economic development at the expense of wilderness and biodiversity, and forest governance remains weak. The SOCP is a collaborative initiative between the Indonesia-based NGO the Yayasan Ekosistem Lestari (YEL; Sustainable Ecosystem Foundation), Swiss-based NGO the PanEco Foundation, and the Indonesian Government’s Directorate General of Natural Resource and Ecosystem Conservation (Ditjen KSDAE). 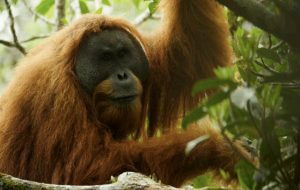 The SOCP works on all aspects of conservation of the Critically Endangered Sumatran orangutan (Pongo abelii) and Tapanuli orangutan (Pongo tapanuliensis). 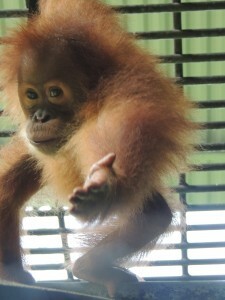 Sumatran Orangutans Need Your Help! After confiscation, all orangutans are first brought to SOCP's Quarantine Center in Batu Mbelin, North Sumatra Indonesia. 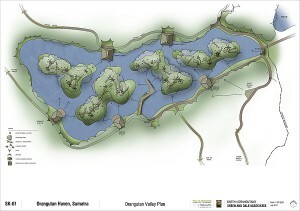 The centre meets all the requirements for a facility of this nature. It is just one hour from the large city of Medan, meaning it is well connected for land, air and sea transport and medical laboratories. Smallholder farms and SOCP’s nearby Orangutan Haven, that provide a constant and varied supply of fruit and vegetables for the orangutans at the Quarantine. The site itself has three freshwater springs, meaning all the water use by the orangutans and for cage cleaning is perfectly clean and safe — nevertheless for added safety the water system is treated to better ensure the orangutans remain healthy. Despite this, it is also in a very green, lush and secluded location, off the beaten track (to avoid unwanted visitors, as it is after all a quarantine facility and closed to the public), and fully supported by the local communities. Local villagers mostly built the facilities and most of the current staff of the quarantine grew up nearby. 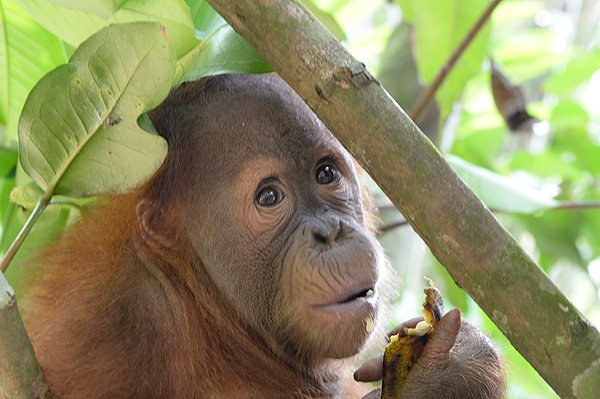 Furthermore, the majority of the orangutans' food stuffs comprise locally grown fruit and vegetables, for which SOCP pays a very reasonable price, since the farmers know they don’t have to go far or wait all day at the roadside to sell their produce. By nurturing these close ties with the local communities SOCP has managed to foster an excellent 'community spirit' and can count on the full support of the indigenous Karo Batak people. ▪ One fully equipped and comprehensive vet clinic complete with examination room, laboratory, office, operating theatre, digital x-ray, ultrasound, and anesthesia equipment, staff bedroom, and autopsy room, storage. 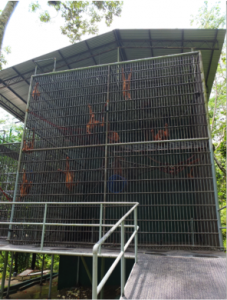 ▪ Five units of four isolation cages (20 cages in all) for housing orangutans during their initial full quarantine period. These are designed to be as flexible as possible. Staff can shut down the doors to create four small cages or open them up to create one large one, and any combination in between. ▪ One set of socialization cages. This unit comprises 6 cages in total: two very large, two medium and two small. Each is interconnected so any combination of large or small cages can be set up. 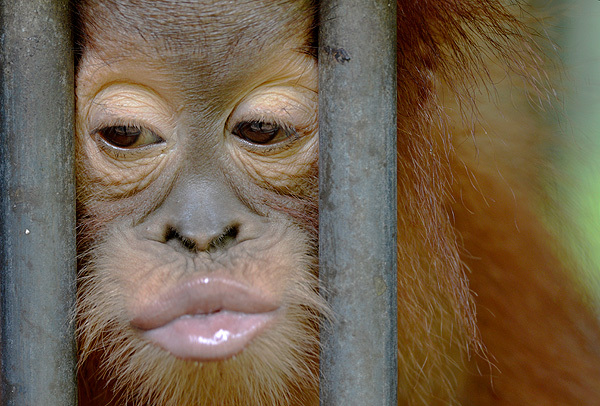 The design allows orangutans to be introduced to each other very gradually, first visually, then via 'touch' contact through the bar-work, before eventually being mixed in the same cage together. This minimizes the stress of new introductions for all concerned. ▪ Infant Care Facility AKA "The Baby House". A facility especially designed to house young infants in the first few years of socialization and care. 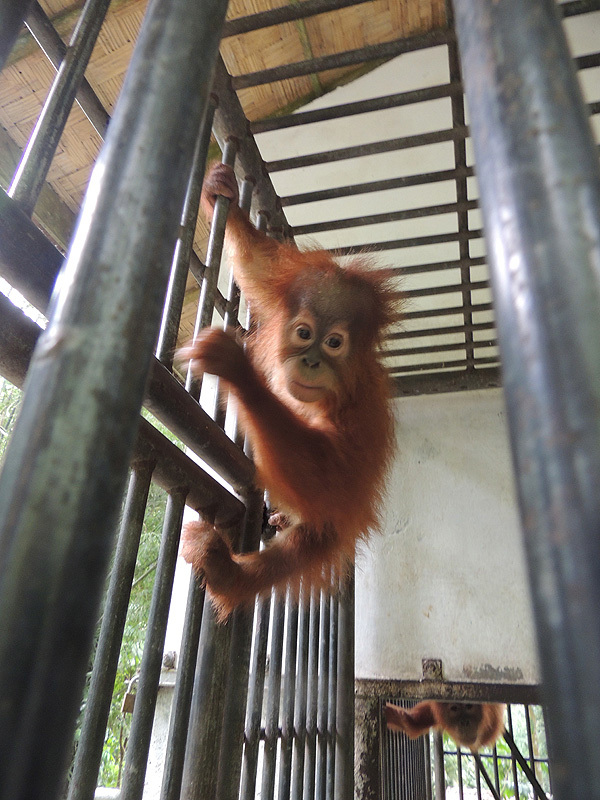 There is an indoor room and outdoor cage, where the babies will learn how to climb and build a nest, socialize with other orangutans and learn what foods to eat. A room and facilities for 24-hour care is provided for a vet and a keeper to remain at the Baby House. 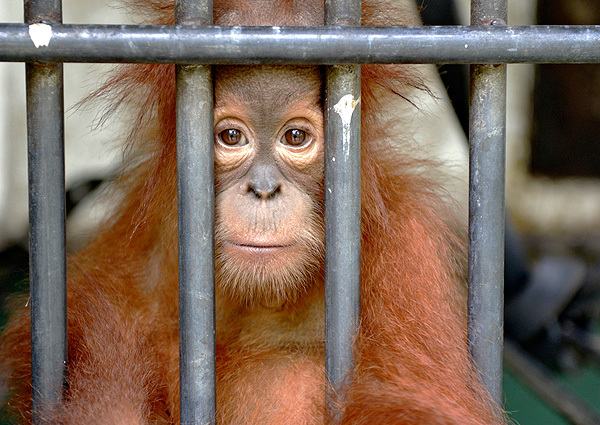 ▪ Four long-term holding cages for orangutans that cannot be released to the wild in the foreseeable future. 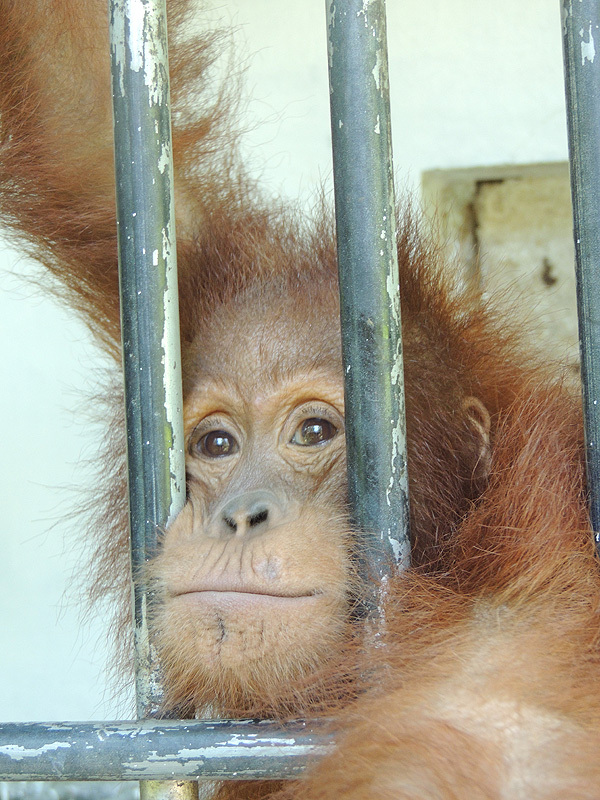 To date these cages house orangutan Leuser (blind due to being shot 62 times with an air rifle), Dek Nong (suffers from a chronic arthritic condition), Krismon (developmentally stunted due to having grown into adulthood in a small cage) and Lewis (blind due to being shot by an air gun multiple times). 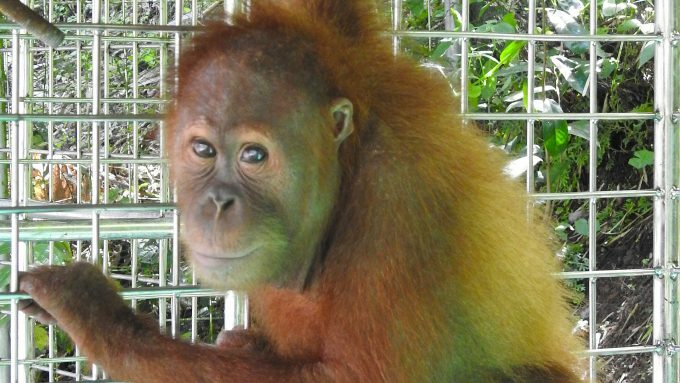 SOCP has plans for an innovative new project that will provide all of these unreleasable orangutans with a much improved quality of life at the Orangutan Haven. 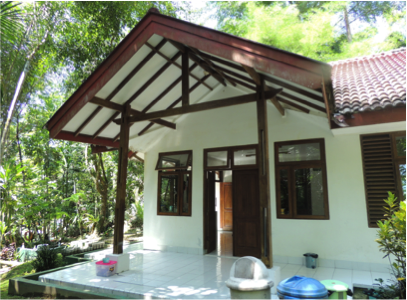 ▪ Additional facilities that are required for the management and operation of the station such as staff accommodation, an orangutan food storage and processing building, a composting facility, staff canteen, and generator housing, among others. ▪ PPD tests, a routine under-the-skin injection to test for tuberculosis that is commonly used in humans and other primates. The medical team also takes this opportunity for a close look at any other wounds and injuries or medical conditions they may have noticed, and record body measurements and weight. Each orangutan then undergoes a kind of 'ID process', in which portrait and dental photos are taken, a tattoo of the individuals "SOCP number" is made on the inner thigh, and a tiny transponder chip (the same as nowadays commonly used with dogs and cats) is placed under the skin. This chip can be read by a special reader and stores a unique serial number. These are all important means of future identification, and also part of the standard procedures adopted by the government for keeping track of confiscated animals. 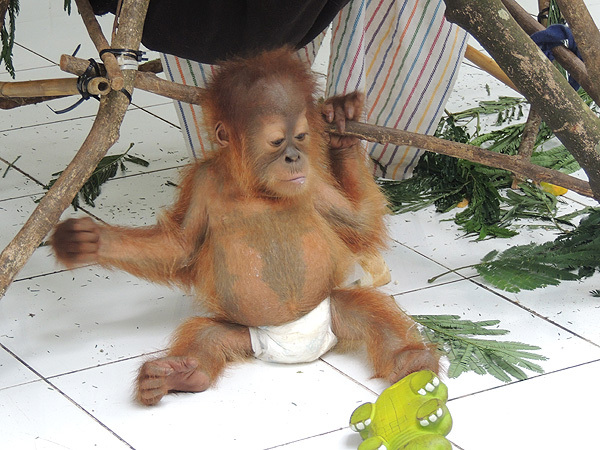 All of the findings of these tests and the unique ID details are then recorded in the individual's own behavioral and medical record files, that continue to be updated as long as the animal is at the quarantine or one of the two SOCP reintroduction centers, and even long after they have eventually been released into the forest, whenever they are encountered and there is useful information to be recorded. 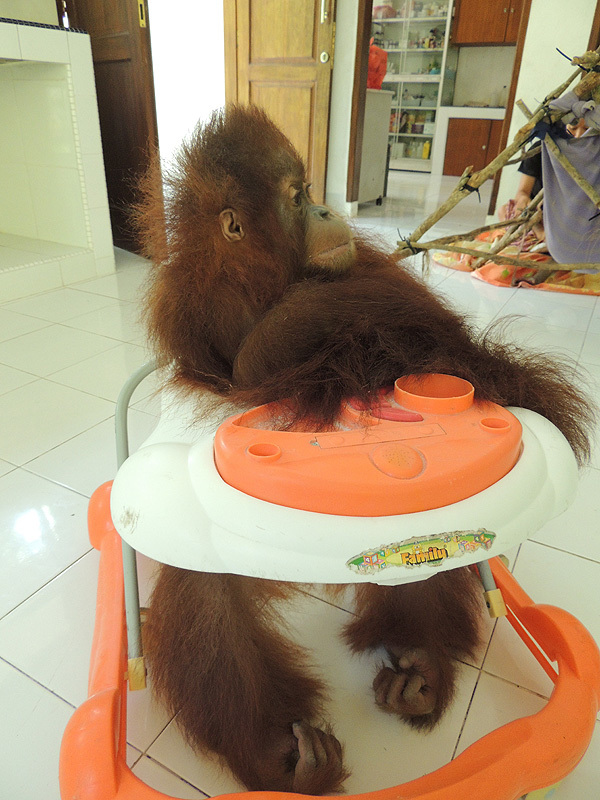 Once fit and healthy, the orangutans are gradually introduced to other orangutans. They learn to interact with each other and "groups" are established which can later be transferred to one of the reintroduction sites together. For most of the orangutans, this is the first contact they have had with another orangutan since their capture and the death of their mother. 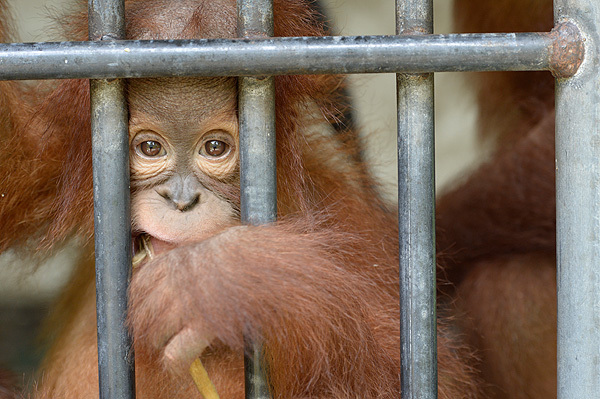 After they have been pronounced fit, the orangutans are transferred to the center's large socialization cages. 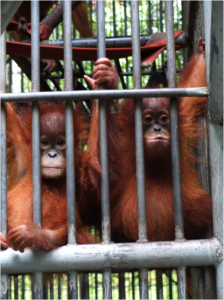 Here they begin the process of learning to be an orangutan once again-- after knowing only humans for the duration of their captivity. 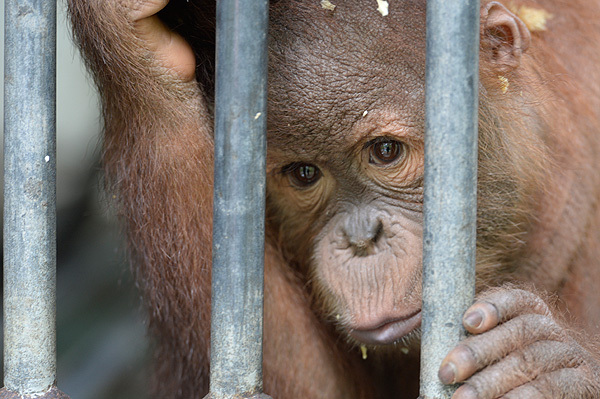 First they are placed in a small "satellite" cage, where they can see other orangutans (visual contact) but without physical contact. 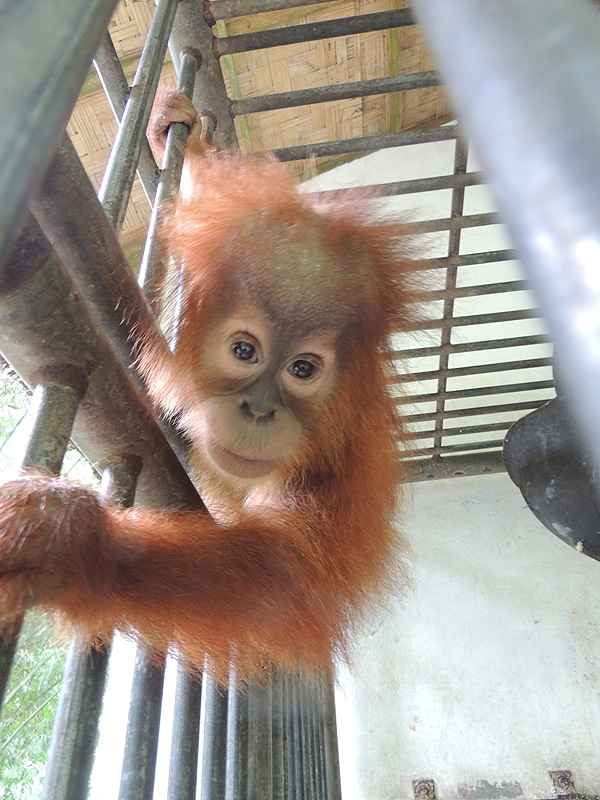 A few days later, they are allowed into a larger cage that is next to the main group. 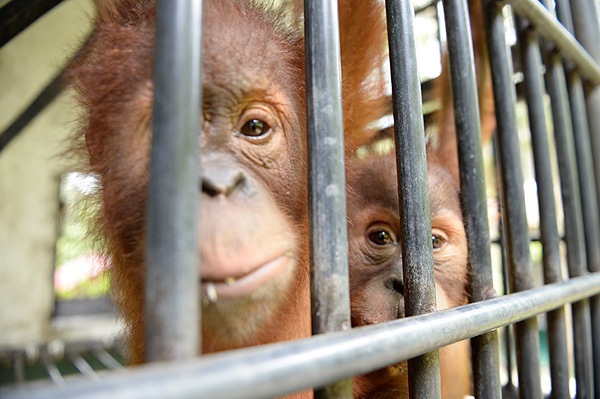 Here they can finally touch and interact with other orangutans through the mesh barwork, but can also get away from each other, too, as they still have their own separate cage and personal space. 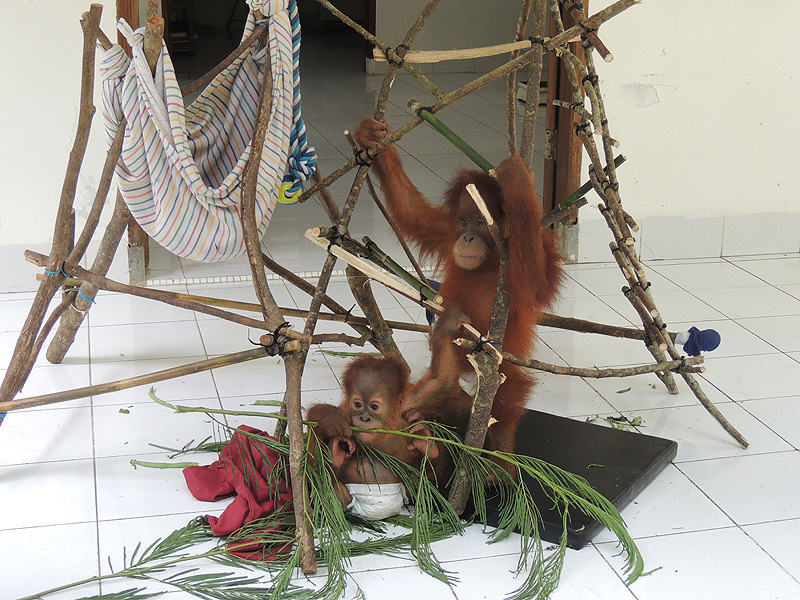 During this time, SOCP staff observes and monitor their behavior for a few days, and once the staff are satisfied that there is no aggression, and the orangutans are likely to get along okay, the door can finally be opened to give them full physical contact with each other. 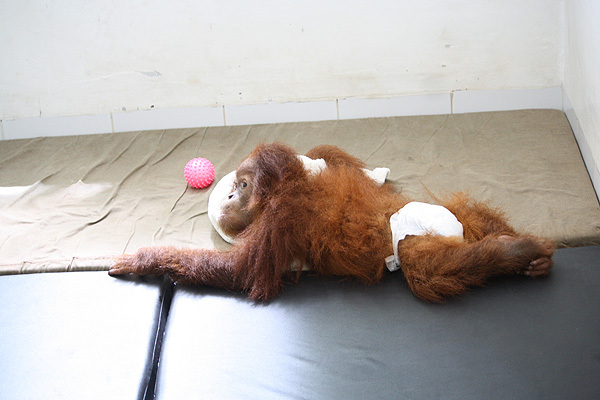 By taking this very gradual, step-by-step approach stress is kept to a minimum and there is a reduced risk of any serious fighting among the orangutans as they jostle for status in the new group hierarchy. This stage in the SOCP process is a very rewarding one. 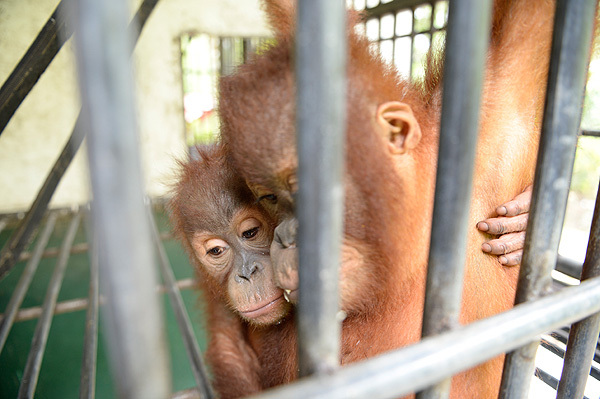 Often when an orangutan meets another orangutan at the quarantine center it is the first time they have done so since their own capture and the death of their mother. 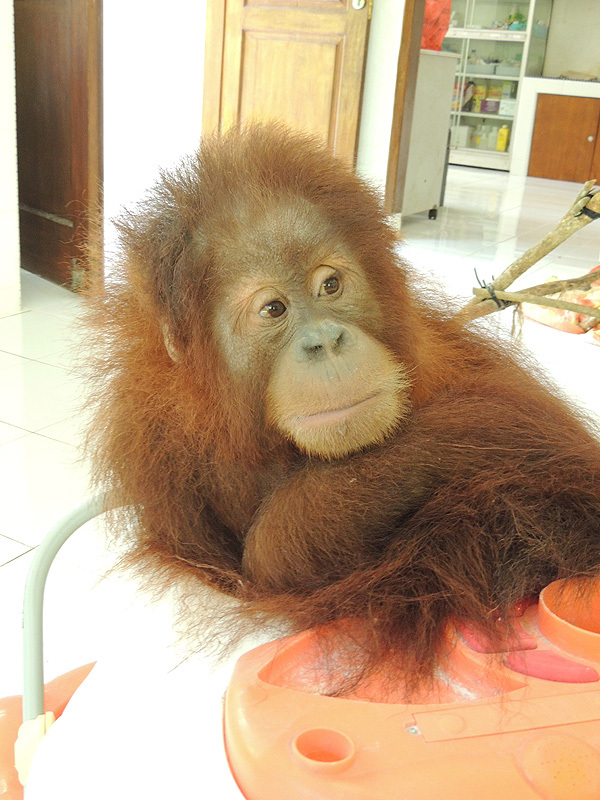 Frequently you can see a new sparkle in their eyes and a renewed enthusiasm about life in general when they first figure out that they can play with other orangutans again. 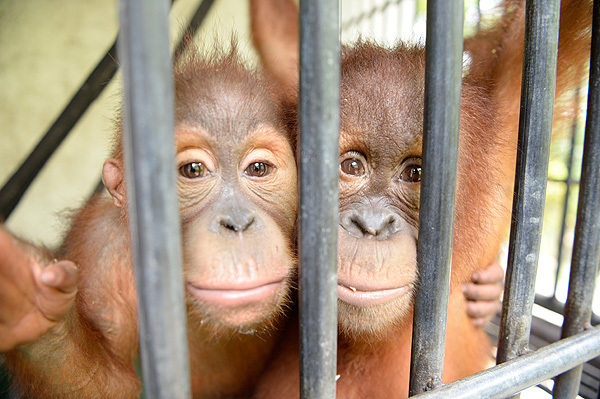 By following these procedures, small 'groups' of compatible individuals can be established and the orangutans have a chance to learn many of the social and behavioral skills from each other that they will need when they are eventually released to the wild. 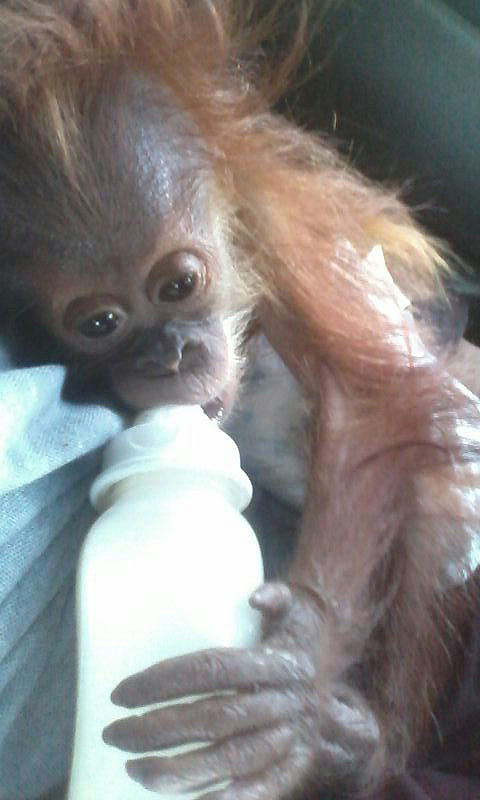 Transfers of orangutans to the reintroduction sites also tend to include individuals from the same 'group', so that they travel and arrive with 'friends', again to minimize the stress of the move and maximize their chances of settling in well to new surroundings. Learn more about the Baby House. SOCP is constantly receiving orphaned babies under 3 years of age. 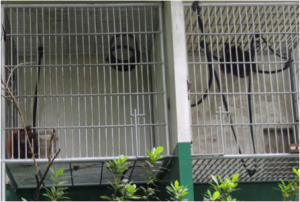 They live in their very own Baby House at the main quarantine site. It is critical to ensure that conditions are optimal— meeting the highest possible welfare standards for the youngest and most vulnerable intakes at the center. 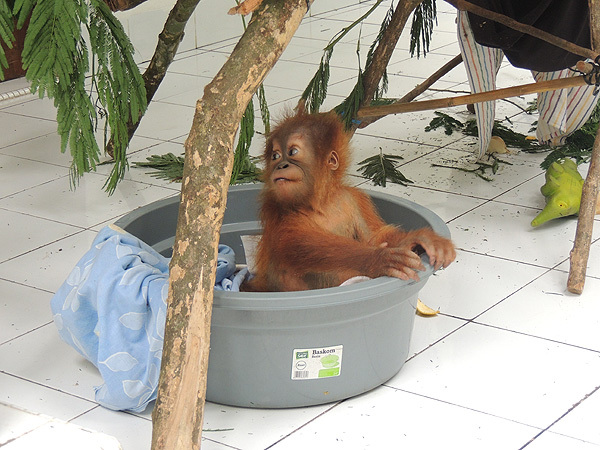 It is also crucial that the babies have a proper space in order to learn the skills required before they move to the socialization cages with the other orangutans. 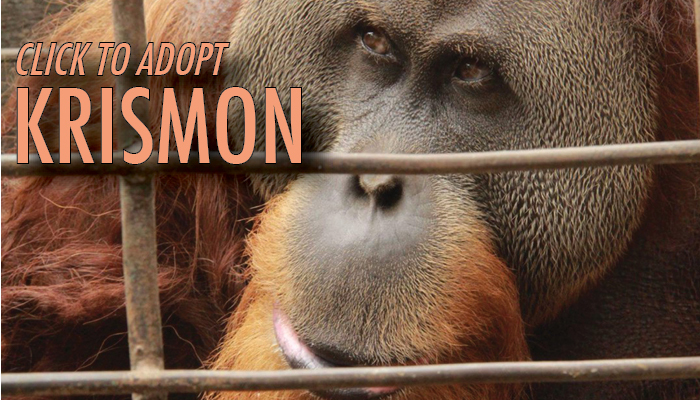 You can directly support SOCP by adopting Megaloman, Molika or Krismon for just US $10/month. 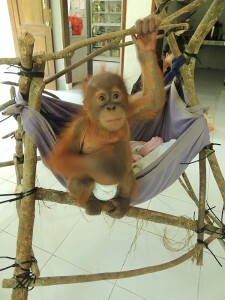 The Sumatran Orangutans Need Your Help!